Many Thais still see Sukhothai’s ritual center as a model of how society and the world are held together. Lots of people admire Thai art for its graceful forms. 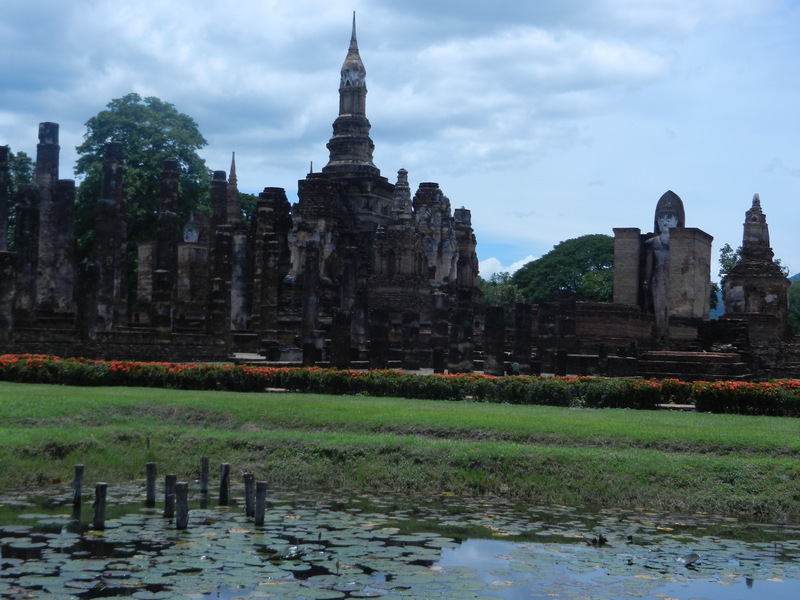 Like Angkor Wat, Sukhothai’s Wat Mahathat’s has a system of a central spire and towers that surround it. Some scholars think they symbolize Mt Meru and the peaks that surround it in Indian mythology. 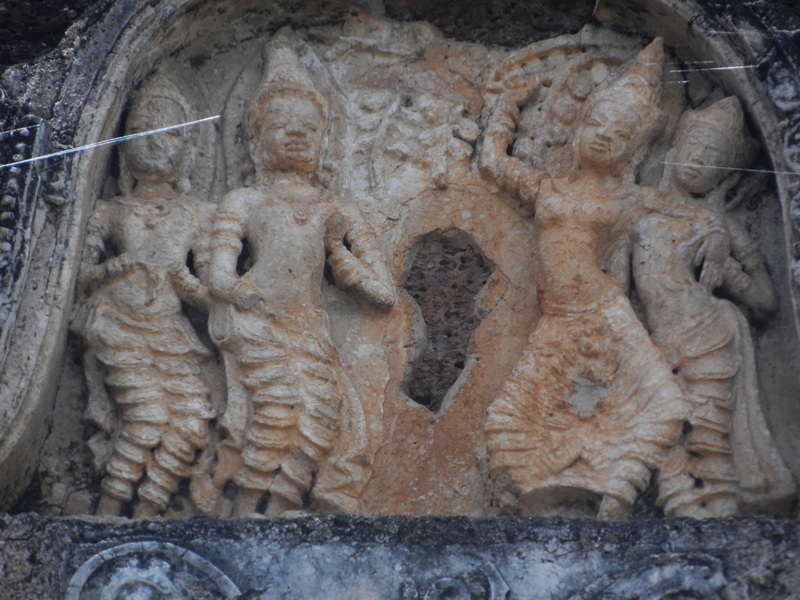 But Sukhothai turned this Indian and Khmer schema into a work of Thai art. I found that the longer you linger there, the more enchanting it becomes. 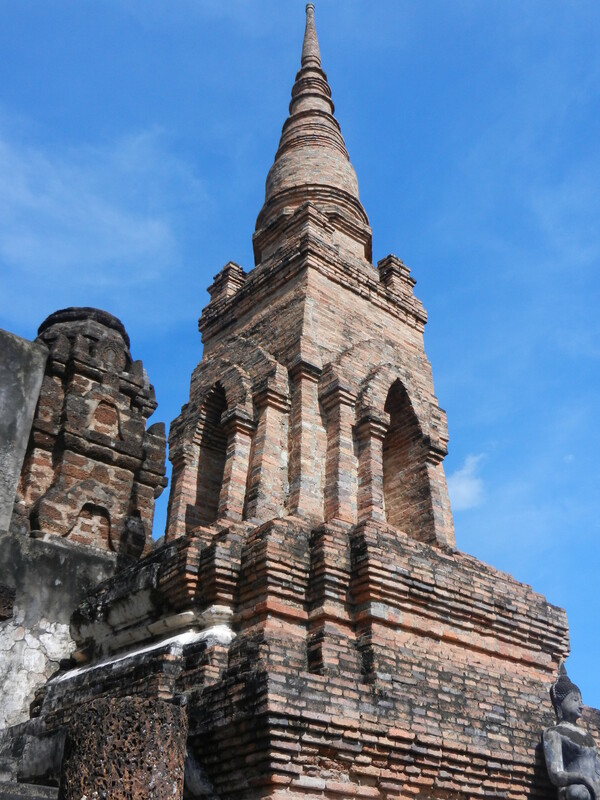 Sukhothai’s Wat Mahathat has 8 towers surrounding its central spire. The middle 4 (in the cardinal directions) are Khmer in style. But in the 1340’s King Lo Thai, helped turn them into Thai style. Stuccoed carvings deck 3 sides of each Khmer tower, and the middle of each frieze has a scene from the life of the Buddha. Only 2 are preserved. The above 2 shots are of the birth of the Buddha. Their humanity makes me wish the other 10 scenes were extant. 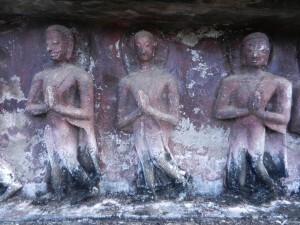 The other scene (above) is of the Buddha departing this world and passing into nirvana. 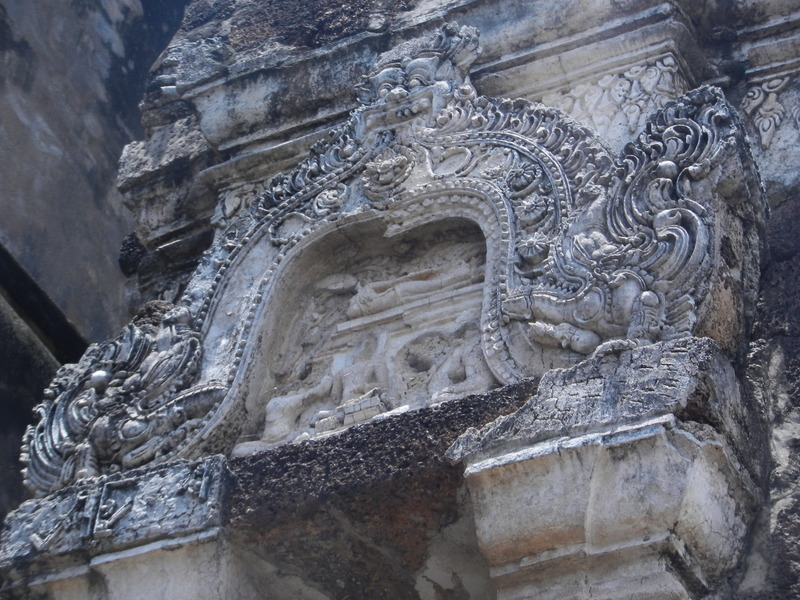 Though this scene graces a Khmer-style tower, the fancy frame around it has a lot of influence from Sri Lanka–craftsmen accompanied the relics from Sri Lanka, which Wat Mahathat housed. The inward turning crocodile heads (makaras) are more Sri Lankan than Khmer–Khmers usually made them facing outwards after the 7th century. But Wat Mahathat is even more multicultural. The 4 corner towers are more Sri Lankan than Khmer. They’re largely modern reconstructions, and they don’t have the original stucco decoration. But Carol Stratton and Miriam McNair Scott thought that their motifs were influenced by designs from the Khmers and from Pagan. So all the towers meshed into a tolerant flow of different cultures’ forms. Stratton and McNair Scott wrote that the stucco designs and the lotus bud on top of the central spire were probably covered in gold leaf. The whole building was covered in white stucco. 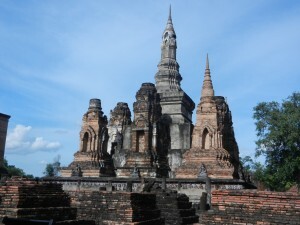 Sukhothai’s Wat Mahathat has been compared to both Mt Meru and Mt Kailasa–Shiva’s Himalayan abode. Stratton and McNair Scott thought that the ponds around Sukhothai’s ritual center represented the oceans around Mt Meru. 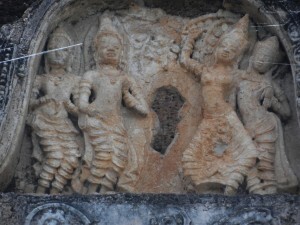 If they did, Thais transposed these big ideas from India into their own art forms and make them more graceful. 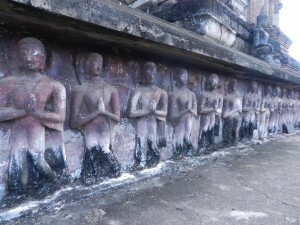 A line of devotees of the Buddha was carved around the bottom of Wat Mahathat. The figures you see are restorations, but the originals also walked around the central shrine with slow and placid steps–just as pilgrims did. Wat Mahathat was meant to be experienced in a relaxed stroll. Its slender spires, gold leaf lotus bud, and stucco carvings would have slowly shifted, and they would have been reflected in the waters. All these images would have gently flowed like a rippling river. 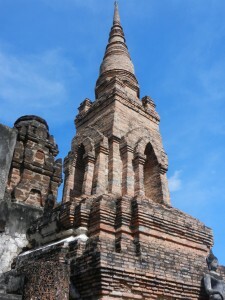 Some scholars have seen Sukhothai’s Wat Mahathat as a magic square–its 9 sections, with the highest spire in the center, might symbolize the creation of the universe and the emanation of its energies. Indians had developed a school of architecture called Vastu by 500 CE, and it saw a building as composed of 81 squares. Many of the squares are occupied by a different Hindu god, and the Vastu Purusa (the cosmic self which represents the universe’s unity) lies across the whole design, with his head in the northeast corner. 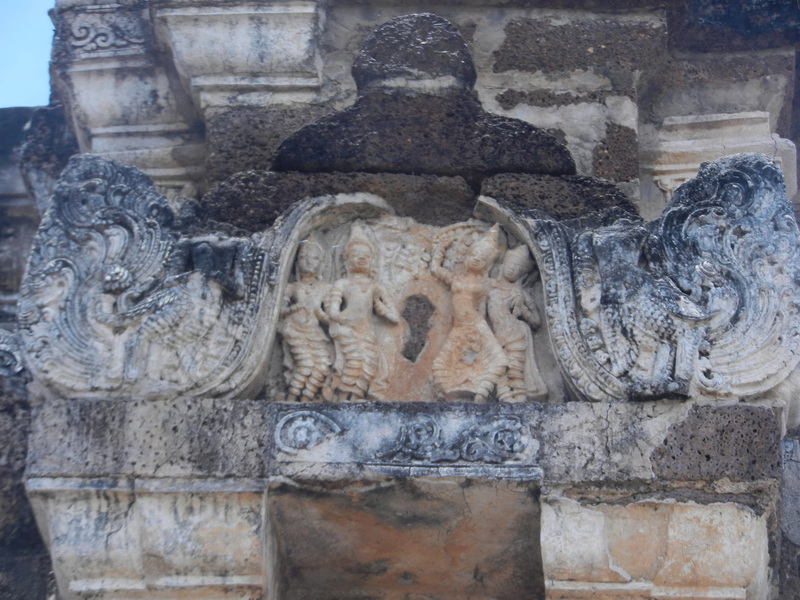 Most Southeast Asian societies already had ideas of spiritual energies in temples and homes before Indians came to the region a little before 1 CE. 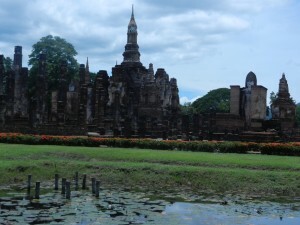 But the people who built Sukhothai’s Wat Mahathat refined these traditions into an expression of the Buddha’s compassion and the Thai king’s benevolence. Sukhothai’s ritual center is like a dream that you don’t want to wake up from. You don’t have to yet. 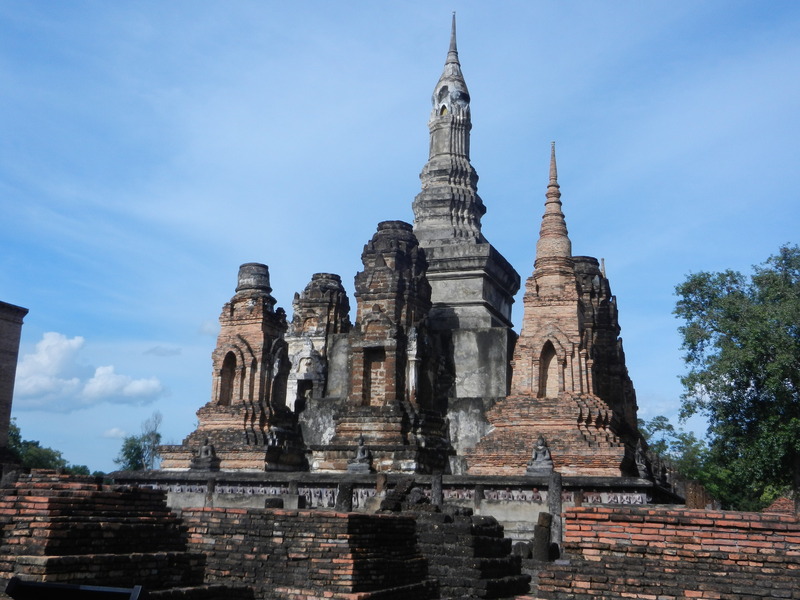 Its enchantments multiply, as we’ll see in the next post on Sukhothai. If you came to my site through this post, you can also go back to the beginning of the dream, in Sukhothai Part One.